Wind barriers and radiant heaters are part of a $3.5 million plan to shield the walkway from the elements. Thousands of people who make the quarter-mile walk from a light-rail train to Seattle-Tacoma International Airport will soon be shielded from the elements. High-strength plastic wind barriers, bright ceiling paint, radiant heaters and four electric golf carts for people who have trouble walking would be provided in a $3.5 million plan, to be funded by airport operating revenues. Port of Seattle commissioners will vote Tuesday, as the first crowds of Thanksgiving travelers make their train-to-plane connections. Improvements would begin late this year and be finished by summer. On clear winter days, when the wind prevails from the north, visitors can feel cold blasts that include fumes from Alaska Airlines jets near their gates. More commonly, dank air carried on southern winds makes travelers uncomfortable. SeaTac/Airport Station has often been panned by people complaining about the walk, via a pedestrian bridge and the north edge of the main parking garage. When it opened in December 2009, U.S. Rep. Jim McDermott, D-Seattle, leaned into the cold weather and predicted that authorities would eventually improve the causeway. “Getting started is the hard part,” he mentioned. Voters recently approved tax increases for eight rail extensions, including a direct connection to Federal Way in 2024 and Tacoma by 2030. Despite its naysayers, the train stop is doubling original ridership estimates and now serves about 7,000 daily boardings, and an equal number arriving. The amenities will help Sea-Tac’s international airport-service quality rating, a staff report says. The airport ranked 15th of 25 peers last year, and the Port has set a goal of reaching the top five. 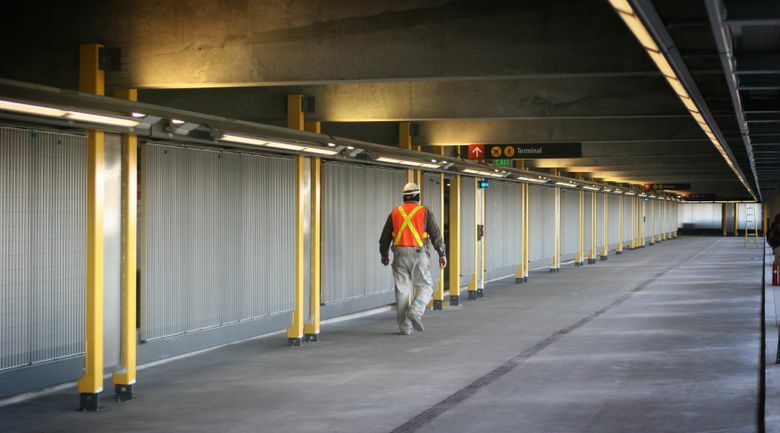 Sea-Tac has no immediate plans for conveyor-belt walkways, as in Portland or Denver, because changing elevations in the walkway here make them too expensive, officials say. On a related issue, commissioners are holding a meeting Tuesday to discuss long-term ideas to improve transportation around the expanding airport, which is on track to become one of the nation’s 10 busiest. Patronage grew 13 percent last year to 115,000, an influx similar to the entire population of Bellevue every day.